Muslim Harji’s portrait of an Ismaili girl in the Wakhan Corridor of Badakhshan. 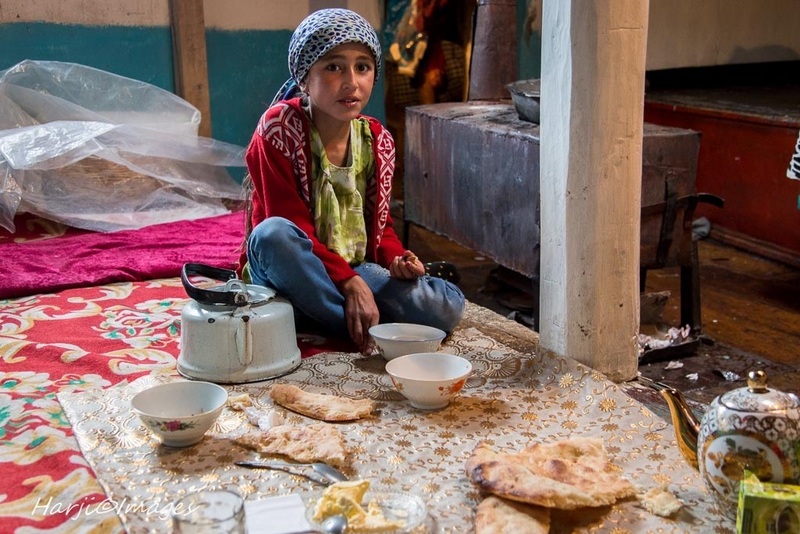 Little Suranoor is seen having her breakfast before getting ready for school in the Village of Namadgut. When my parents visited me in Voorhees, New Jersey, during the spring of 1995, we would together walk to the main library twice a week. The short walk passed by scenic ponds and streams. There was a scary component to it though — encounters with scattered groups of unfriendly geese. Once in the library, our focus was to read the Sunday newspapers from nearby cities that made their way into the magazine and newspaper section by Monday. During one such visit, my dad found himself staring at the Baltimore Sun’s wonderful two page spread of Mawlana Hazar Imam’s first historic visit to Tajikistan, that had taken place a few days earlier. The June 4, 1995, story gave a moving account of the visit by the paper’s correspondent Kathy Lally. It was obvious that she was well acquainted with the Ismailis, and also understood the emotions of the Ismaili people, who had greeted their Imam for the first time in centuries. To my delight, an on-line version of the report did become available, and I reproduced it on Simerg, with the Sun’s permission, some 5 years ago under the title A Western Correspondent’s Account of the Aga Khan’s Historic First Visit to His Followers in Gorno-Badakhshan. The photo was taken during Didar (Invitation) – a celebration that takes place on 28th of May every year to commemorate the anniversary of the Aga Khan’s visit to the village in the 1990s. During the celebrations the villagers dress up, dance outdoors to the accordion and drums and sing ginane (religious songs), which tell of him being their Noor (light). The photograph was taken as these girls, dressed in bright atlas silk fabric with crowns on their heads, were going out to dance. Photo: Matthieu Paley. Copyright. Two decades are not long in the life of a community, and for each of these past twenty years, since Mawlana Hazar Imam’s first visit in May 1995, the Ismaili community of Gorno-Badakhshan has commemorated the historic visit with a celebration known as “Didar” (a Glimpse, of the Imam) or “Noor” (the Light, that the Imam represents). The happiness of this annual event was captured by world-renowned photographer Matthieu Paley in the picture above where Ismaili girls are proudly displaying a framed decorated photo of their beloved Imam. Subsequently, in addition to many other Badakhshan pieces, we published Ismaili Portraits From Tajikistan, by Khorog’s most distinguished and beloved ‘foreign’ permanent resident, Dr. Ali Rajput of Birmingham, England who in his personal capacity has served the jamat in Badakhshan in numerous ways. Another piece that we were fortunate to publish was a personal account from Gulnor Saratbekova entitled “Shukr Mawlo, Shukr Mawlo” – When Hope is All You Have Left, describing the dangerous and nervous state of affairs during the prolonged period of civil strife and unrest in Tajikistan in the early 1990’s. Her gratitude, shukr, in this piece is of course to Mawlana Hazar Imam who through the work of his Imamat institutions averted a serious famine that the jamat and other countrymen faced during the Civil War. I would strongly recommend that readers visit the links mentioned for some historical memories. Scenic Badakhshan. Please click on photo for an incredible collection of photos of Badakhshan. Photo: Muslim Harji. Now, Simerg is happy to present a photographic series dedicated to Badakhshan and Central Asia by none other than Canadian photographer Muslim Harji of Montreal. While he admires and cherishes the memories of the beautiful landscapes of Badakhshan that he captured with his lens, what he has come away most from this visit is the hospitality and warmth of the Ismaili people of Badakhshan. Harji’s incredible photo essays about his journeys to Jerusalem, Dubai, Iran, Turkey, South and South East Asia, have been seen by thousands on this blog, and we are delighted to add this new one to Simerg’s superb photo collection. Please click The Ismailis of Badakhshan Through My Lens by Muslim Harji. With Tajikistan and Badakhshan now more accessible than ever before, and with so many exciting Imamat projects underway in that part of the world, we hope that Harji’s story will inspire the professional and youth of the jamat to visit this remote and beautiful region. By the way, there is an incredible array of well-organized professional tours to the region that are led by highly experienced non-Jamati operators in North America and Europe. Having viewed the ‘Memories of Badakshan’ photos I am reminded of my own travels to Hunza where I voluntarily taught spoken English to teachers for around 5 months with encouragement of Al-Waez Ghulam Abbas Hunzai. The resemblance of both these communities is striking. After all it was Pir Nasir Khusraw who brought Ismaili faith to them, unlike various dais and Pirs who took it to communities in Indo-Pak region. Dr Ali M Rajput and the writer/photographer Muslim Harji are both seen together in one of the photos, the former is known to me as our first Mukhi in Birmingham where I am now a member. My thanks go the Editor Malik of http://www.simerg.com for posts of this kind. I had honour to meet him recently on a family visit to Canada.